While one certainly cannot complain about the popularity and sheer enormity of the Metal scene these days compared to the unfortunate dry spells that have come and gone over the years, it seems that bands are more identified with their specific subgenre than with their actual material. This compartmentalization has led to more acronyms than the national security state, a mind-boggling situation that seems almost too arduous to keep up. 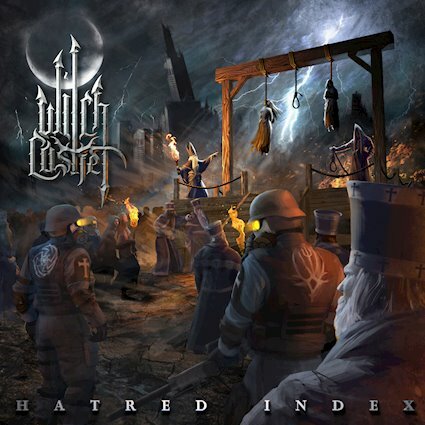 Thankfully, though, Witch Casket have blessed the scene with their debut EP, Hatred Index, an exercise in sheer brutality, melody, atmosphere, and some damn fine riffs! When the album begins with the title track, there is the feeling of opening a door and seeing a site that is unforgettable and/or breath-taking coupled with getting sucker punched. Blast beats drive the sound with an intensity one simply cannot “un-see”, melodic guitars enter painting their colors over the fierce drumming, and suddenly, it turns into a rhythmic affair. Witch Casket have a very classic Death Metal approach in that neither the rhythms nor the guitar harmonies take over the song but are rather seated methodically next to each other in an approach that presents a very listenable affair of a lot going on at one time. Things like the bass fill at the 1:51 mark are touches that add words like professional, slick, and elite to describe the band’s sound. The second track, “That Damn Devil,” continues the intensity and then turns it up a notch as the band maintain their uphill trend, and when the third track, “Dawn Everlasting,” hits, it’s officially RIff- Fest 2018! “The True Knot” is the final track and is certainly the catchiest and most memorable of the songs. The guitar solo covers a lot of ground both melodically and technically as it’s truly an exposition for mastermind, Colin “Nylock” Cameron, and the final minute of the song extends the exercise presenting a dramatic, almost-cinematic element with keyboards adorning arpeggios. The arpeggios are successfully the perfect choice to use as the album fades to black. Hatred Index effectively sounds as if it was written for the pit. It’s a truly pummeling experience, a short album that never loses its intensity, and the perfect accompaniment for driving to work or at the gym. The riffs are huge, replete with subtle chugs here and triplets there that let the listener in on the true precision with which they are played. The lead work is outstanding as it complements the magnitude of the music with a melodic frame, putting it all into proper context, and wowing the crowd with the deft, Dimebag-like use of the whammy bar. With the vigor and savagery offset with melody with which Witch Casket plays, one can almost imagine this being close to what Strapping Young Lad‘s masterpiece, City, would sound like were it envisioned and executed today with Death Metal vocals. Like that classic, Hatred Index just does not relent…at all! To sum it up, the band uses the elite precision of Thrash, the brutality and technicality of Death Metal, and Black Metal touches here and there for pure atmosphere. It’s a mixture of influences that has become a homogeneous representation of a most-welcome band of brutality. Metal people, please welcome Witch Casket!